Woodland critters?!? How could you not think of the holidays with these cuties? 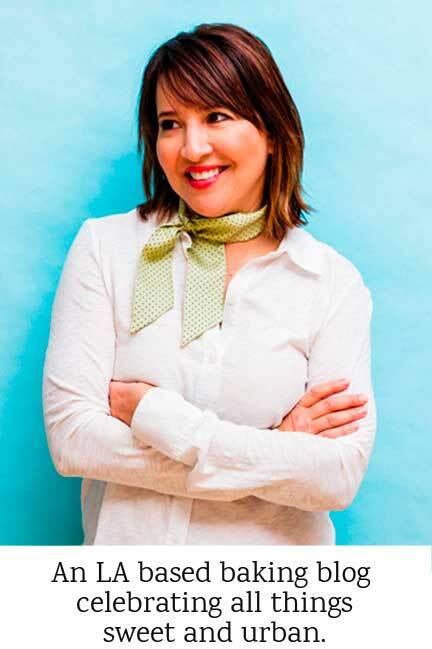 As we speak, I’m currently sitting in my hot LA kitchen conjuring up a forested winter wonderland, with a blanket of snow on the ground, a moose and a hedgehog frolicking among the trees. Ok, you got me, there aren’t any moose in LA, and definitely no snow. But these almond cookies help bring a dash of coziness to my holiday. Plus, they’ll make perfect gifts so I can pass on my imagined wintery woodland scene to friends and family. Dark chocolate melts for decorating. 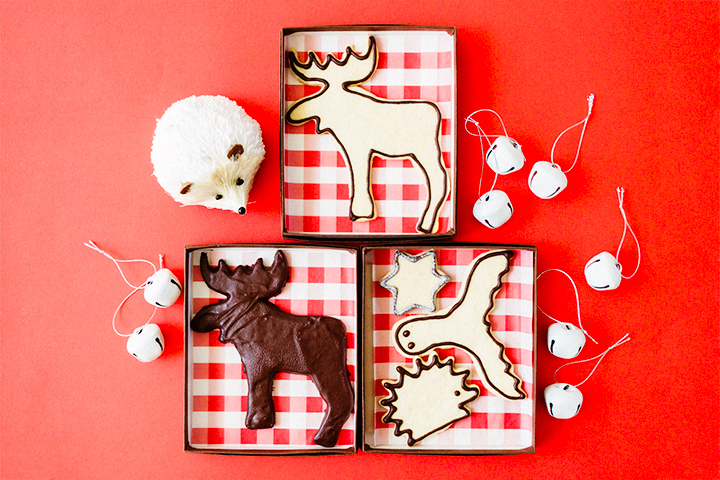 Fun cookie cutters – like Moosey or Hedgie from Ann Clark! Almond flour (or sub in with hazelnut flour). 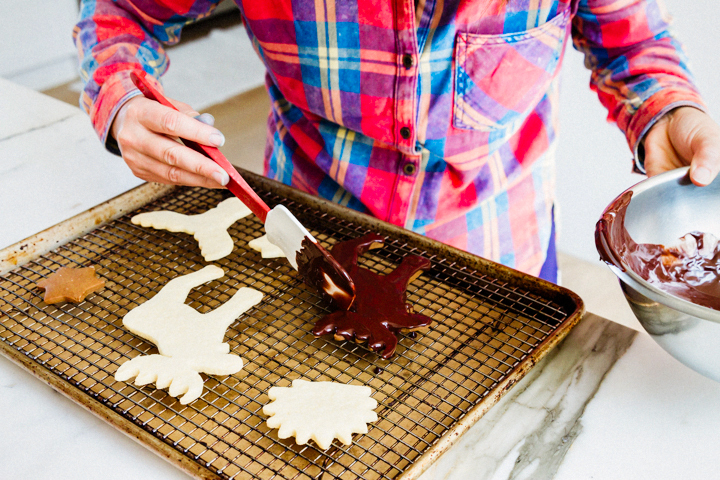 And, if you don’t have either in your pantry, skip on over to my perfect sugar cookie recipe). I made Bon Appetit’s Hazelnut Cookie recipe, but subbed in almond flour. It’s super easy to make. Here’s a tip: have a few things ready to go before you start to roll out your dough disk. No need to hunt around the kitchen while the dough is drying to a hard brick. 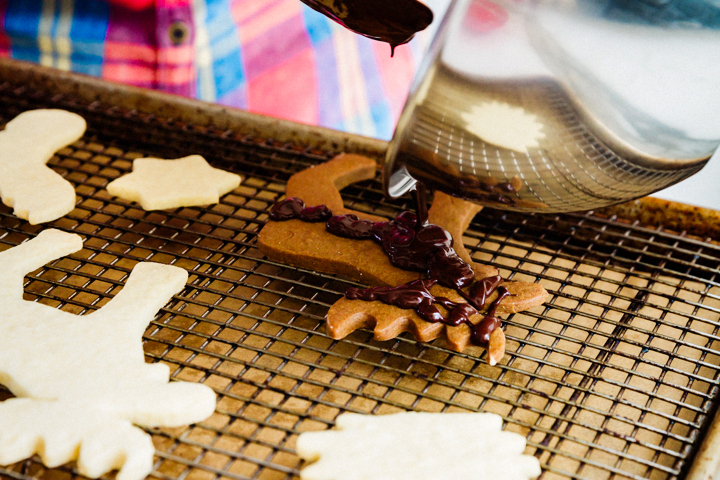 Plastic wrap, rolling pin, cookie cutters, and a cookie sheet are all handy items you should have out before you pull out the dough from the fridge. Place your disk of dough between the saran wrap and this will help keep it as cool as possible while you roll it out. Once you roll out the dough to about 1/8 inch – 1/4 inch thickness, remove the plastic wrap and cut out the fun shapes. 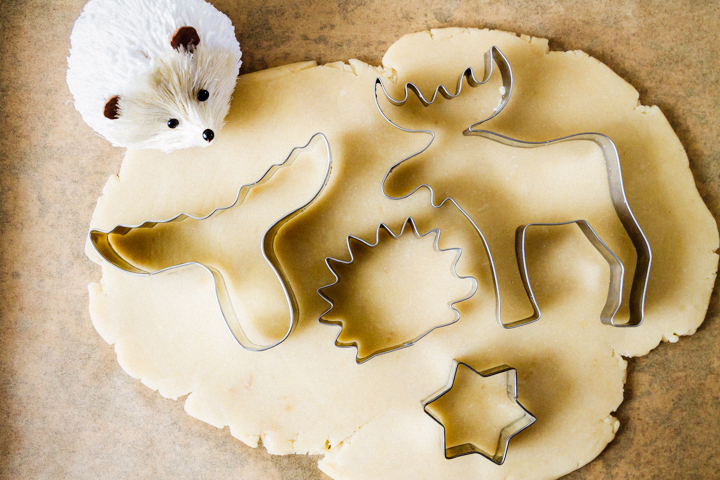 In this case, I used these adorable Hedgehog and Moose cookie cutters. Although I’m calling this recipe Holiday Critters Almond Cookies, I also made two other doughs: gingerbread and sugar cookie. If you’re making one dough, it’s easy enough to make a batch of another. I love a cookie tin mixed with different options for the taste bud. Who doesn’t love adorable Hedgehogs? Or Moose? I love the curves and spines of these chosen rustic winter critters because it just means we can add MORE chocolate outlines! So let’s moooooooooose along to the actual how-to. Take the melted chocolate (microwaved) and plop it into a piping bag or a ziploc. 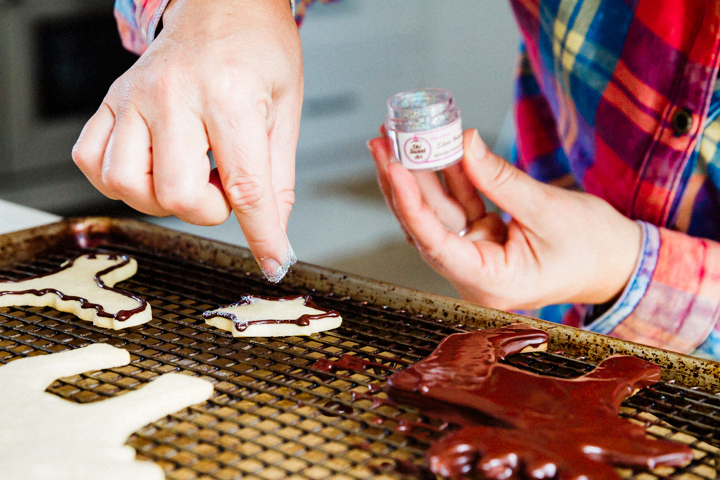 Make a small cut in the corner so you can pour out a small steady stream of chocolate for the outlining. There really is no wrong way to do this. It does take a bit of a steady hand to get the curves of the animals, but no one cares if its a perfect line as long as the nutty chocolate flavor is spot on! 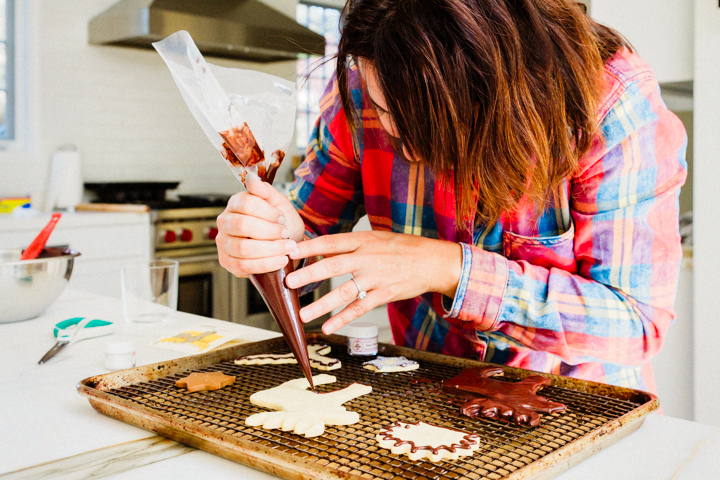 You can also pour the melted chocolate right on top of the cookie, and smooth it out all over with a spatula. Top with CK Disco Dust (or other sanding sugar) and your critters are complete! Make sure to let the chocolate dry before loading them into cute bags or boxes, like these from Paper Mart. You can also wrap the boxes with a red ribbon and tie on jingle bells, or even this hedgehog I found at Joann’s. 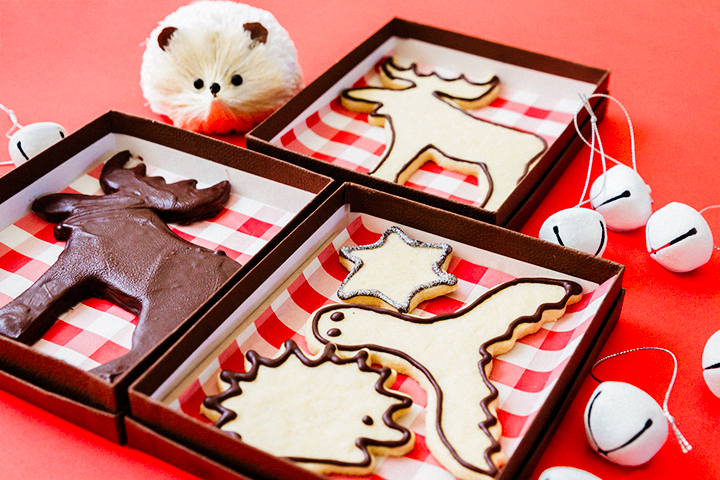 Your holiday critter gifts are complete! 1 cup chocolate melting discs for decorating. 1Position rack in center of oven and preheat to 325°F. Line large baking sheet with parchment paper. 2Whisk flours and salt in medium bowl to blend. Using an electric mixer, beat butter and sugar in large bowl until smooth. 3Beat in vanilla and egg. Beat in flour mixture until just combined. 4Shape dough into a disk and refrigerate until firm. Roll out dough, cut, and then freeze. 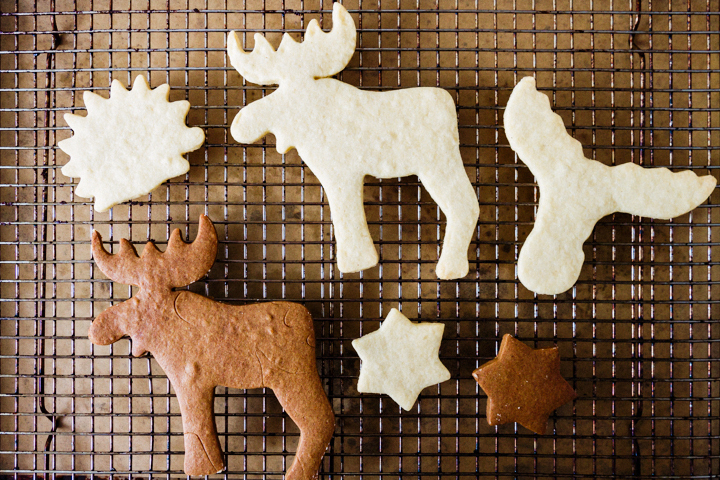 This will help them hold their shape while baking. Once firm, then place on prepared baking sheet, spacing 1 inch apart. 5Bake cookies until light golden brown around edges, about 20 minutes. Cool on baking sheet 5 minutes. 6Transfer to rack; cool cookies completely. 7Decorate - Melt chocolate discs in microwave in 30 second increments until smooth. Then pour into a piping bag. If you don't have a piping bag, use a ziploc bag and cut the corner just enough for the chocolate to drizzle for decorating. Thanks for the different dough options — I prefer gingerbread but haven’t tried almond. Love the hedgie! I hope there are some more hedgehogs left at the store – I need some more for gifts! I love these. They are so adorable, and a perfect gift option for Holidays. 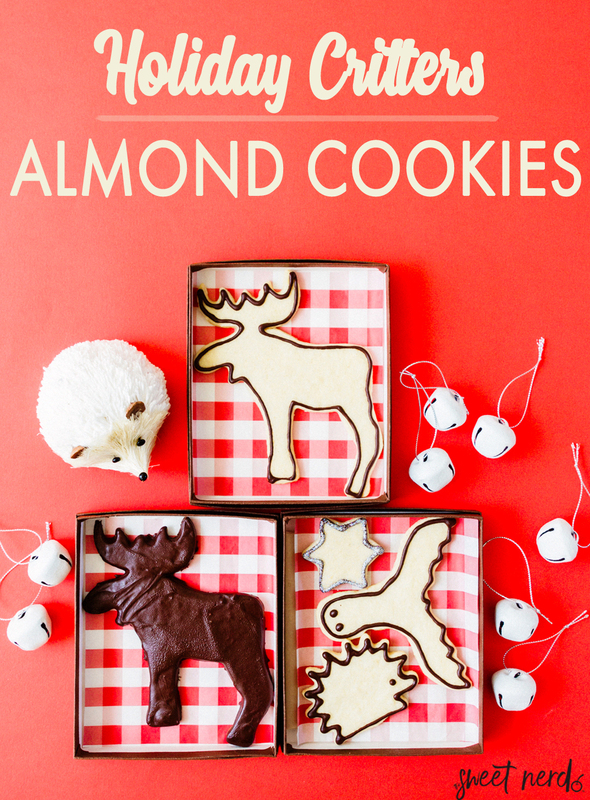 These cookies are just so cute and I love the idea of making almond based cookies! The almond dough is so good – hope you try it. LOL! Yes you are right, no snow in LA. 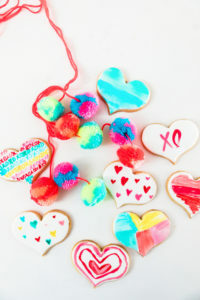 (As a side note, hope all is well with the fires by you) Love the cookie ideas and that little hedgehog is super cute. Serena – thanks for asking, we’re all ok. 17 miles seems too close when you’re entirely dependent on which way the wind blows! 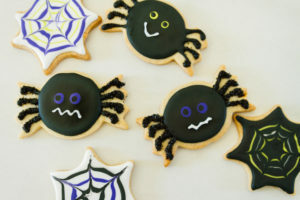 These cookies are so adorable! I don’t know if I can eat them up! 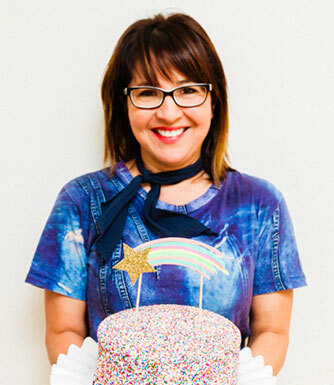 😀 I also had no idea they made edible glitter that looked SOOO glittery! So neat! 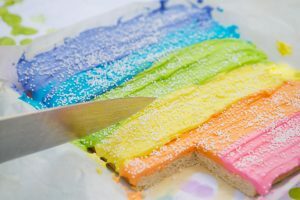 I loooove edible glitter. You can easily find it on Amazon. Woodland critters don’t get enough limelight and this is a wonderful way to do it. I agree! I love the little woodland critters! 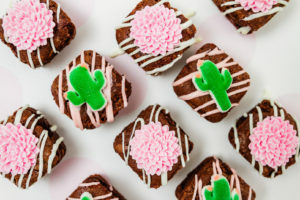 These are almost made to box and give out as sweet treats and cool eats. I can see these as being a major hit with teachers as back-to-school gifts. Love it! Ha ha – well they’ll be back to school soon enough in January. And yes, these would make great teacher gifts. These are so stinking adorable. 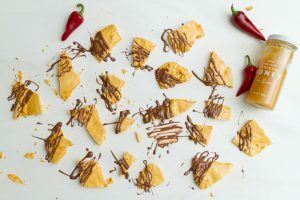 I’m wondering if you have any suggestions on making these completely gluten-free? Lorna, it’s all in the flour you use. There are lots of great options for gluten-free flour at the grocery these days. If you do try it please let me know how it works!